Many inventions and new technologies developed in the past few decades rely on a good understanding of the atom and its subatomic particles. Production of electricity, function of electronic components, television, X-Ray, light and atomic energy are just a few of the technologies that are based on the properties of atoms. Making a model is a good way of learning about atom and its subatomic particles. In this project you will make a model of an atom of your choice. In this project you will make a 3 dimensional model of any atom of your choice. A model of Argon atom is being constructed and pictured in the project guide; however, the information provided can be used to construct an atomic model for any other element in periodic table. The project guide also include the atomic specification of Hydrogen, Helium, Lithium, Beryllium, Boron, Carbon, Nitrogen, Oxygen, Fluorine, Neon, Sodium, Magnesium, Aluminum, Silicon, Phosphorus, Sulfur, Chlorine, Argon, Potassium, Calcium, Scandium, Titanium, Vanadium, Chromium, Manganese, Iron, Cobalt, Nickel, Copper, Zinc, Gallium, Germanium, Arsenic, Selenium, Bromine, Krypton, Rubidium, Strontium, , Yttrium, Zirconium, Niobium, Molybdenum, Technetium, Ruthenium, Rhodium, Palladium, Silver, Cadmium, Indium, Tin, Antimony, Tellurium, Iodine, Xenon, and Cesium. 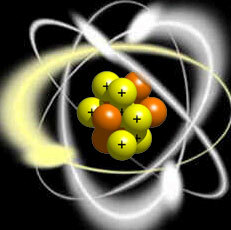 The specification will help you to construct an atom model for any of the elements named above. This is a display project in which you will build a model. You will have no question, hypothesis or experiment for this project. More details or support for this project is available at the members section of ScienceProject.com web site. Material needed for construction of the atom model may be found locally in most areas.